Super practice: it is a week to go till the SuperBowl and I am prepping with this special brew from Baladin. 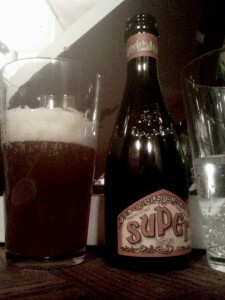 I drink it to be auspicious, not only because of the name Super, but also it’s a Baladin (more on that next Sunday). And it’s yeasty golden and the bottle black. And, outside and in, this is a beautiful beer, in color, texture, and taste. Big without being overpowering, it swirls fruity flavors–cherry, apple, lemon–in a yeasty earth storm. Complex and surprising, it still manages to keep a consistently drinkable balance. This entry was posted in Belgian, Pale Ale. Bookmark the permalink.